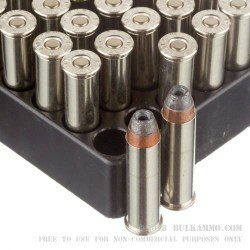 This 357 cartridge by Remington features a 180 grain bullet. The bullet sports a semi-jacket, giving it nice penetration characteristics while still permitting its hollow point to shine. When this cartridge’s bullet hits its target, it will mushroom out to cause exactly the sort of devastating damage that you can count on for personal protection. This cartridge also offers a non-corrosive Boxer primed brass casing, so you may reload it multiple times if you plan on training with your self-defense round at the range -- always a wise move, to be comfortable with the ammunition you might one day stake your safety on. 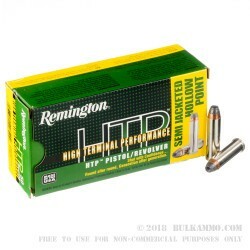 Remington offers their High Terminal Performance (HTP) ammunition as a combination of premium primers, brass cases, and propellants certain to provide instant stopping power in the self-defense situations that most call for it. After 200 years in business, you may comfortably place your trust in their products’ superiority.